I know many of you are visiting my blog today expecting to find one of my humorous 'Life As We Know It' posts, however in light of the dreadful natural disasters that have occurred in Japan this week, I felt that humour really wasn't appropriate. As I turn on my television and watch endless scenes of devastation, suffering and immense loss, I find it difficult to breathe. This whole catastrophe too huge to comprehend. As I look around at all the things I take for granted each day; my children playing happily together, my husband telling me he loves me, my dog nuzzling me for a hug and my home safe and still standing in one piece, I can easily come to terms with how life changing it would be to lose them all in a matter of minutes. So with this in mind, I ask you all today to visit the website specially set up to raise money for these people who have lost everything they ever owned. 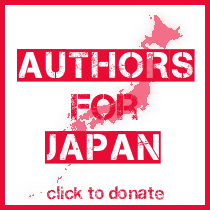 Authors for Japan is an emergency site that was created by author Keris Stainton, with the help of a large group of friends. They have spent the last few days tirelessly organising this auction. All money from the auction will be donated straight to The British Cross Japan Tsunami Appeal. Everyone involved in this has given their time and gifts freely. The auction is open from now until Sunday 20th March (8pm UK time). Within the auction there are some amazing gifts for the avid reader and the unpublished aspiring author. From a 1000 word critique of your novel by the successful author Katie Fforde to signed books from lots of fantastic authors including Dorothy Koomsen. I strongly suggest you visit the website and have a look at what is on offer. I know how badly our country is suffering at the moment financially, yet we still have our homes and families.These people have nothing left, so please consider helping to bring a little happiness back to their lives. I'll go take a look... thanks. Visiting right now. The footage on the news literally brings tears to my eyes. Very nice idea, Vivienne. The tragedy is so incredibly awful, so difficult to fathom. Yesterday I posted a link to the Japanese Red Cross Society in my blog's sidebar. This is a great idea! I'll be checking out the books on offer! thanks for the link! its terrifying and heartbreaking what has happened.